Freedom and Flourishing: Does the McClure report provide a basis for sensible welfare reform? Does the McClure report provide a basis for sensible welfare reform? My first impression of the report of the Reference Group on Welfare Reform was not favourable. I couldn’t make sense of it. 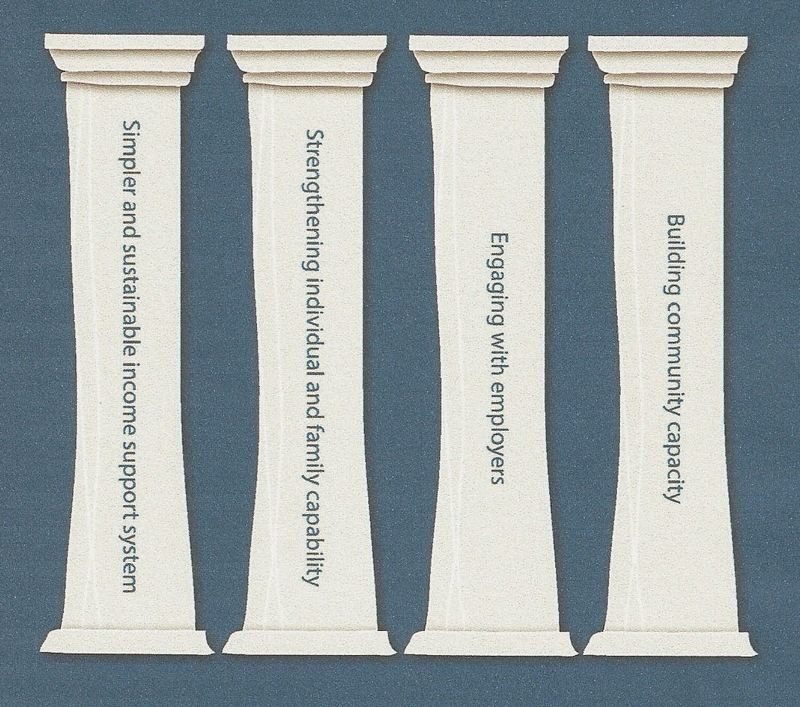 The four pillars metaphor got in the way of the story the report was attempting to tell. When I went looking for the structure that the pillars were meant to support I got lost. So I then went looking for four major problems that reforms were intended to address and could only find two. At that point I realized that the pillars were just a device to tell readers that the material in this report has been organised under four subject headings. The reason why the material was organized in this way still escapes me, but that probably doesn’t matter. The report was probably not intended to be read by people like me. One of the major problems that the members of the reference group (Patrick McClure, Sally Sinclair and Wesley Aird) have sought to deal with is the complexity of the existing system of welfare payments. The report is concerned that complexity creates problems for individuals in understanding the system and accessing support, and makes it more difficult to administer the system efficiently. There is also an underlying problem of inequity, with people in similar circumstances being treated differently. The reference group has proposed a simplified payment architecture, with five primary types of payment. It looks like a sensible reform, but I am not well placed to comment. Conducting actuarial calculations annually to estimate the lifetime liability (i.e. contingent liability to government) of the overall income support system and support for specific groups. Identifying those groups at greatest risk of long term income support dependence and those groups with the strongest chance of breaking this reliance with tailored support. Making a broad range of services available to assist at-risk clients to break their reliance on income support. The Federal Government is envisaged to be the driving force behind service delivery. Ensuring that interventions are evidence-based, and “testing and learning” to ensure continuous improvement of support services. The proposed investment approach seems promising, but it is not obvious that the report has taken into account criticisms of the New Zealand scheme, such as those raised by Simon Chapple in an article published in 2013. Chapple pointed out that the investment approach adopted in New Zealand can produce policy outcomes that are inconsistent with a standard cost benefit framework. For example, the investment approach counts movement of people off welfare for any reason – including movement into the black or grey economy, emigrating and going to prison - as a benefit. It provides the administering agency with an incentive to focus on reducing government spending rather than achieving more desirable outcomes such as helping welfare beneficiaries gain employment. In my view Chapple’s objections to the New Zealand scheme should probably not weigh heavily against the adoption of a similar scheme in Australia, but the issue deserves more careful consideration than I can give it here. It would have been desirable for the reference group to have discussed the issues involved in its report. It will be interesting to see how Patrick McClure or other members of the group now deal with the similar criticisms that have been raised against their proposals by Michael Fletcher. They can hardly argue that their report speaks for itself. If this report had been prepared by the Productivity Commission I am sure it would have provided a more thorough investigation of the fundamental issues that should be considered before the government adopts an investment approach to welfare along New Zealand lines.